Ricardo is a native of Bogotá, Colombia (South America), and the Lord brought him to the Master’s Seminary where he completed an M.Div. (2010) and a Th.M. (2012). Vonna is originally from Oregon, and she earned her master's degree in Biblical Counseling from The Master’s University (2008). Ricardo and Vonna met while Ricardo was finishing Seminary, and they share a passion to serve their Savior and advance the Kingdom of God. 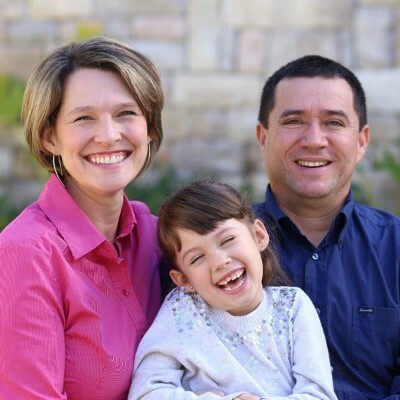 In January 2012, they were blessed with a daughter (Viviana Grace). From 2012 to 2017, Ricardo shepherded a Hispanic Church plant in Santa Clarita, California. The Morales family is now excited to serve the Lord in Colombia, a place where Ricardo’s training and shepherding experience is greatly needed. Though plagued by wars and violence for almost a century, Colombia’s greatest need is not just political peace, but the power of God (the gospel) to change the hearts of its people. Colombia is a predominately Catholic country that in recent years has been flooded with false teaching, particularly influenced by the charismatic movement. Spiritual experiences, good works, and financial giving are peddled as the means of salvation. Though hungry for the truth, most Colombian pastors shepherd with a very rudimentary understanding of the gospel and have never had any formal biblical training. Their faith is not established on the right interpretation of Scripture, but on emotions and spiritual “fads.” This reality makes pastors and their congregations easy targets of false teachers. Ricardo’s single and most important goal is to train and equip pastors and lay-people in the Word of God. Please pray for God’s grace and wisdom as he feeds his soul with Scripture to fulfill this role. Please pray for Ricardo and the team he will be working with, as they seek to fulfill all the requirements for the Colombian Training Center to be established and approved by TMAI. Working alongside the local church is paramount to accomplish the biblical model of teaching and equipping disciples. Please pray for the Morales family as they join and serve in Comunidad de Gracia Bogotá (a church plant Fernando Jaimes is helping establish). Please pray for Vonna and Viviana Grace to quickly adapt to the Colombian culture.